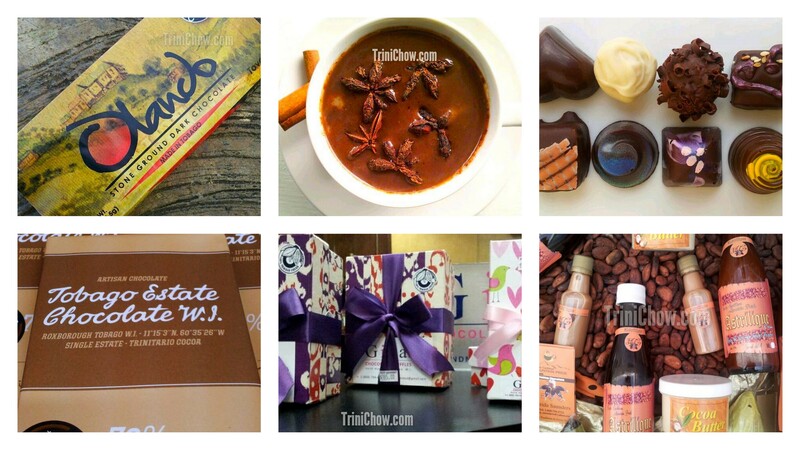 Indulge your sweet tooth, GO LOCAL and support Trinidad & Tobago’s chocolatiers by purchasing local chocolate products, which include decadent chocolate truffles, dark chocolate bars, cocoa balls for making chocolate tea, chocolate liqueurs, and more. BRASSO SECO CHOCOLATE CO – dark chocolate bars (60%) – Sold at The M Store at Piarco International Airport, gourmet markets, and available for order directly from the Brasso Seco Paria TAC. COCOBEL CHOCOLATES – dark chocolate bars, bonbons, chocolate bark confections and cocoa powder – Sold at Malabar Farms Gourmet Shop (Maraval, Trinidad); Medulla Art Gallery (Woodbrook, Trinidad). Order directly from cocobelchocolates@yahoo.com. JB CHOCOLATES (GRAND COUVA ESTATE) – chocolate bars (50% milk, 70% smooth dark and 75% dark chocolate) – Sold at The Shop at The Normandie in St Anns, Nichossa Restaurant in San Fernando and UpMarket. Order directly from jbchocolatebars@gmail.com. OMARBEANS ORGANIC – chocolate bars (plain and with cocoa nibs, coffee nibs or ginger when in season) currently available at Happy Gourmet in Valsayn, Gourmet Life in Chaguanas, Hilton’s Gift Shop, Malabar Farms and New Earth Organics. Truffle and bonbon boxes will added to the line-up for Christmas. Also available by order at (868) 753-1449 or email omarbean.organic@gmail.com. SUN EATERS ORGANIC – chocolate bars and hearts and organic cacao powder – Sold at Artie’s Gourmet Shop in Diego Martin, Malabar Farms in Maraval, New Earth Organics in Woodbrook, Cascade Mini Mart in Cascade, Happy Gourmet in Valpark, the duty free M Store at Piarco Airport, Vanilla Bean in Cunupia, Gourmet Life in Chaguanas and Shore Things Cafe & Craft in Tobago. Also available by direct wholesale orders for weddings and other special functions. (868) 326-7631. GINA’S CHOCOLATE TRUFFLES (Gina Artisan Chocolatier) – chocolate truffles and chocolate caramels (product line includes vegan truffles) – Sold at Malabar Farms Gourmet Shop (Maraval, Trinidad); The Happy Gourmet (Valsayn, Trinidad); Be Free Foods (St. James, Trinidad); Okazions at Westmall; Stechers Fine Gift Stores (6 mall locations and Duty Free stores at Piarco International Airport). Order directly from ginastrinidad@gmail.com. EXOTIC CARIBBEAN MOUNTAIN PRIDE – drinking chocolate and chocolate liqueurs – Sold at many supermarkets, gift shops, and stores in Trinidad & Tobago as well at Santa Cruz Green Market on Saturdays. Order directly from astrida_saunders@yahoo.com. HOUSE OF ARENDEL (Trinidad Chocolate Factory) – dark chocolate bars, nibs, cocoa balls , drinking cocoa and cocoa butter made from single domain Trinitario cocoa. Order directly from info@arendel.com or (868) 677-3455. HOUSE OF OLANDO CHOCOLATE – stone ground chocolate bars (70%) – Order directly from house.olando@gmail.com; Ciao Cafe (Scarborough, Tobago). LONG’S CHOCOLATE – chocolate (coco or coffee nib) bars and chocolate truffles filled with locally inspired ingredients. Sold at Malabar Farms in Maraval and directly from Long’s Chocolate at info@longschocolate.com or (868) 350-1888. CACIQUE CHOCOLATES – chocolate truffles (product line includes sugar-free chocolates) – Available at Stetchers Piarco and Long Circular Mall. Order directly from caciquechocolate@hotmail.com. THE LOPINOT CHOCOLATE CO – chocolate bars and other cocoa related products. (868) 680 5423. VIOLETTA FINE CHOCOLATES – chocolate truffles and chocolate mini-bars– Mini-bars sold at Ciao Cafe (Scarborough, Tobago); Truffles and bars at San Antonio Estate (Gran Couva, Trinidad); Order directly from violettachocolates@gmail.com. Where can I find white chocolate locally? Try Cocobel or Suneaters Chocolate, they may be able to help. Hi, I am looking to purchase chocolate melanger/refining equipment. Does anyone have any information on where I can get this locally? Where can I locate vegan chocolate in northwest Trinidad? Contact Suneaters for locations and availability. Are you located in Trinidad and Tobago or are you looking for international retailers of Tobago Chocolate? Add Sun Eaters Organics https://www.facebook.com/suneatersorganics. Find our products at: Artie’s Gourmet shop in Diego Martin, Malabar Farms in Maraval, New Earth Organics in Woodbrook, Cascade Mini Mart in Cascade, Happy Gourmet in Valpark, the duty free M Store in the airport, Vanilla Bean in Cunupia, Gourmet Life in Chaguanas and Shore Things in Tobago. We also take direct wholesale orders for weddings and other special functions. Thank you for your comment, we will update this list shortly with your information! I buy local chocolates whenever I can. Love that Trinbagonions are manufacturing our own gourmet chocolates and not just shipping the raw product abroad to be crafted into chocolate and then resold back to us.